Papers: In the Donald Wells Anderson Papers, 1890-1972, 5.6 cubic feet. Papers: In the John W. Byrnes Papers, 1938-1972, 142 cubic feet. 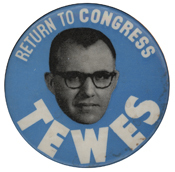 Correspondents include Donald E. Tewes.